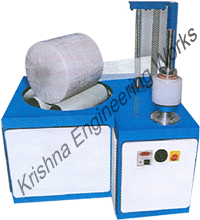 • Can be used as Reel Wrapper and Pallet Wrapper & Change-over is by a single switch. • Counter gives Stretch % applied & quantity of Film consumed in each Reel / Pallet. • Provision for wide range of reel diameters. • Various levels of protection can be achieved by using flexible control of turn table and Reel speeds. • Sturdily built for handling reels upto 1.5 tonnes by weight. • Low profile height of turn table for easy loading and unloading of reels. • Pit mounting of machine is possible so that loading & unloading of Reels is at Ground Level. • Applies pre-stretched film delivered from State-of-Art Powered Pre-Stretch Unit. • Film stretch percentage can be easily adjusted to optimise film consumption and provide sufficient protection. • Ideally suited for paper, film foil, tyrecord fabrics and similar materials produced in reel form.